It’s that time once again – it’s our anniversary show. We are 10. As is our annual tradition, for our 206th broadcast we look back over the last year, its 25 shows and 27 guests. Running down – with a 20 minute snippet from each – the 3 most popular sessions from the last 12 months. Interspersed into that, I play tracks from among the 471 I’ve played on the show over the last 25 transmissions. To be still doing this show, now into its 10th year, is nuts. That’s down to two main things – the continued barrage of awesome sound and music so many make, and the listeners. You. Massive shouts to you for continuing to support, stream, download and share the show. Massive, bowelshaking shouts to all our guests in year 9. Do please get in touch with us at Darkfloor letting us know who your favourite guests were, your favourite tracks, your standout labels, and your suggestions for guests in the year to come. You can reach us on email, Twitter, Facebook, Mixcloud and YouTube. Again, huge thanks and love for the support of the show to each and every one of you. 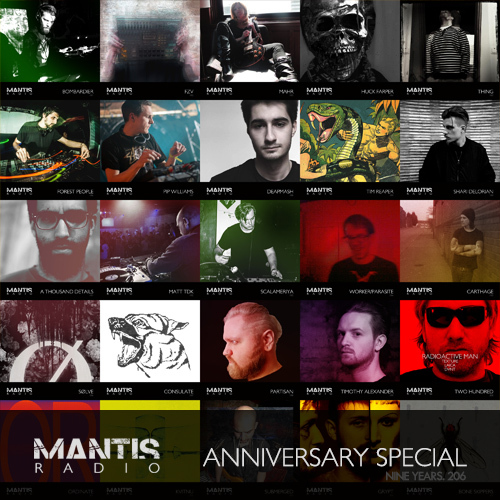 Mantis Radio returns June 21st with Japan’s Ryuji Takeuchi.